There is no such thing as 100% sun protection in a sunblock, but when it comes to choosing between the many varieties of sun lotions today, many people believe this to be its distinction. However, there just isn't any sun product made with either chemical or physical sunscreen ingredients that can provide that 100% full protection from the sun. Hence the word 'block' can be misleading and the word 'screen' is preferred. Protection can be provided for about 98% of the suns' UVB rays and with a select few ingredients, a high percentage of the UVA rays. So then, how best do you take care of yourself or your child when it comes to sun protection? Some people will refer to a 'sunblock' as meaning the ingredients physically reflect the sun's rays, as opposed to a 'sunscreen' which chemically absorbs them. The physical blockers, or reflective ingredients, are zinc oxide or titanium dioxide, and they have the added benefit of blocking UVA rays in addition to UVB rays. 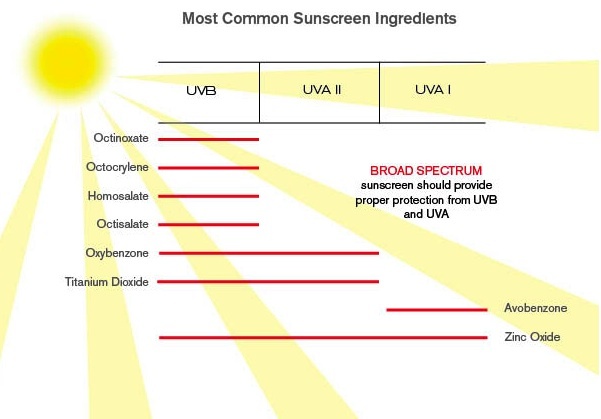 The chemical absorbing ingredients are known to only block the UVB rays, with the exception of Avobenzone. Bottom line, you essentially need to understand what it is you are looking for, which then requires you to inspect the labels and the ingredients. Most importantly, you need to look for both UVA and UVB broad spectrum protection and the most protective of all the ingredients is zinc oxide. A lot of people associate zinc oxide sun protection with the thick white sticky substance used by sportsmen such as cricketers and surfers on their noses, lips, ears and cheeks. However, over the years, many strides have been made to enhance the wearability of this mineral. Legislative organisations around the globe are concerned about people believing incorrectly that a sunblock will provide them with 100% complete protection from the sun. It is now not recommended, and even legislatively illegal in many countries, to use the word on the packaging.